Insuring a business can be complicated, but smart operators can take an active role to reduce their risk. 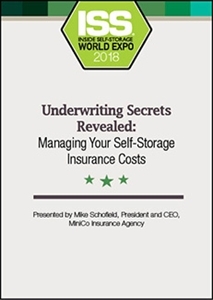 Get underwriting secrets to help control insurance expenses and improve your risk-management profile. Insuring a self-storage operation can be frustrating for owners who feel they have no say in the process, but savvy operators play an important role in calculating insurance costs. During this informative session, our presenter will reveal the underwriting secrets that can help you control these expenses, helping you understand the key elements of your risk-management profile.